The Hot Dog Truck: CASH MONEY CONTEST! Everyone is always looking for a way to make money online. One way to make money online is to win MY CONTEST! I have a Tip Bucket at the Hot Dog Truck. 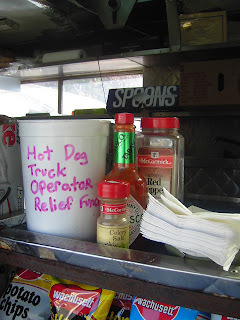 Written on the bucket are the words "Hot Dog Truck Operator's Relief Fund." Customers drop a lot of change into the bucket to show their appreciation for eating the best hot dogs. I take the bills out every day but I let the change build up until it gets almost full, then I pop over to a Coinstar Machine and cash it in for folding money. So I am going to have a contest related to this bucket. The PRIZE FOR THIS CONTEST will be ONE HALF of what is contained in the "Hot Dog Truck Operator's Relief Fund" as of May 31, 2007! You will need to guess the total amount of cash in the bucket without going over. Who ever is closest to the total amount without going over (can you tell I've watched the Price is Right) will win the cash! (I will actually send a money order but "cash" sounds so much better...) The "Fund" is pictured below. Hopefully the other objects in the picture will give you an idea of the size of the container. FYI it holds 5 pounds of Tuna Salad. You must announce my contest on your blog in a post and you must link both the contest post page with the phrase "CASH MONEY CONTEST" and the main page of my blog with the phrase "BEST HOT DOGS." Then email me at hotdogman@thehotdogtruck.com with the link to your post, AND your guess for the total amount in the "Fund" without going over. On May 31 I'll pop by the Coinstar machine, cash in the bucket and see who won. I will announce the winner on the Blog and contact the winner via email to arrange sending a money order. There is a CASH MONEY CONTEST going on at the Hot Dog Truck, the place with the best hot dogs online. Click to enter the Cash Money Contest NOW! You can spice it up if you want, but that's basically what I am looking for. Only one entry per Blog, please. If you have multiple blogs, you can enter for each one as long as you announce the contest on each one. I wish they HAD hot dogs in China!! oops sorry hadn't read the entire post before I sent in my guess. I'll follow directions now!